We have for too long measured customer impact in terms of demographics and market share. We now need to focus deeper into the impact we make in the lives of individual customers. This calls for a more intimate knowledge of our customer. There is no marketing or research agency that can deliver this knowledge to us, as experts focus too much on the numbers game, abstract averages and generic types. We need to directly enter into a conversation with our customers, to learn from them more about themselves, so we can make that value offering they want and need. Or better still invite them to design what they want! We need to do the tango with our customer! The real estate boom in India is interlinked directly to the industrial and economic growth as well as stability and strong presence of multinational companies throughout the country have made India the preferred destination for investment in real estate sector. India has been adjudged as one of the fast growing economy clubbed with buoyant stock markets and healthy economic growth which have enabled India to emerge on global arena. India has one-sixth population of the world (or says around 17%) and for such a huge population, there always exists a high demand of residential, commercial, retail and industrial properties which have transformed the real estate business very lucrative. Based on the real estate boom in India all big developers and builders have launched their major projects in all big cosmopolitan cites in the segments as needed or demanded by the local markets. The swelling population figures of major cities year after year bear testimony to the fact that India's massive urbanization march is on. As per the World Bank projections, urban centers in the country will be accounting for 40 per cent of India's population by 2030, and the figure will cross the 50 per cent mark by 2040-45. A recent McKinsey Report has predicted the number of people living in cities by 2030 to be 59 million, with 68 cities having a population of more than a million. These figures don't paint the picture of a rosy future for our already congested and constricted cities with fragile infrastructure. With a projected shortfall of 30 million dwelling units by 2020, the need to look for effective solutions becomes all the more imminent. According to an estimated, there was a shortage of 27 million houses during the Eleventh Five Year Plan (2007-12) which provides a big investment opportunity. In 2010, India has led the pack of top real estate investment markets in Asia. Prices of the residential properties in North India saw an upward swing in 2010 with prices in realty segment going up to 40 to 50 per cent for the apartments or builder floors and 60 to 70 per cent for the residential plots, and independent houses. Real Estate analysts point out the rising demand for residential properties by end-users as the main reason for the price rise. Another reason is that several big real estate developers have started new housing projects in the North Indian cities like Chandigarh, Mohali, Ludhiana, Amritsar, Bathinda, Jaipur, Noida, Greater Noida, Gurgaon and Ghaziabad. The real estate market has been encouraging in the northern region. The prices in the residential sector firmed up for the customers. Also, the realty developers made a swing towards the luxury housing segment not like in the year 2009 where the spotlight was on affordable housing projects. The real estate sector in the North India has seen a boom in 2010 with the end users coming to forefront. The reality financers, speculators and the short-term investors were missing from the market. Punjab has been upbeat in the residential properties with an increased supply and consequently prices surged. The prices also increased in Chandigarh due to various policy changes including increased ground coverage and floor area ratio. The ground coverage has been increased from 50 to 70 per cent of the plot area and the floor area ratio is increased from 1:50 to 2.00 to for a 10-marla residential plot. There has been significant demand in the affordable segment in the region, with many leading developers witnessing 80-100 per cent absorption within the first few weeks of project launch. By positioning project pricing for mid income and lower mid income segments, developers were able to address the housing gap in the NCR to a certain extent. Today, around 30% of India's population lives and works in urban areas. This means that they occupy less than 2% of the land available in the country. However, the problem is larger than just Delhi-NCR which continues to get negative press only because of its exorbitantly high property rates and enormous annual inward migration. Despite everything being said on the matter, the shortage of affordable housing in India is not better. The country's urban population of 285 million has multiplied itself by five over the last half century. It is projected that it will continue to increase at this fast pace, and that 50% of all Indians will be living in urban areas by the end of the next three decades. So, if the shortage for housing for the lower income segment stands at 25 million today and there is no increase in the pace of supply of affordable housing launches, what will this figure look like in 30 years? The property markets in the Northern region remained relatively stable during the Jul-Sep 2011 as compared to the July-Sept 2010 period. The National Capital Region had witnessed a small appreciation in values during this quarter on account of improved infrastructure facilities and connectivity. However, this appreciation was limited to select localities. Further, cities such as Noida and Greater Noida are likely to have an oversupply of residential space, mainly in the affordable segment. This is due to the fact that developers are expected to start giving possession of their projects by the end of 2011 or by mid 2012. This is expected to put pressure on values. India's small cities are likely to offer better growth prospects and price stability for real estate developers and buyers than large market such as Delhi-NCR, is showing signs of slowing sales and rising prices. Sale of new residential apartments in 10 small property markets identified for the study is estimated to touch Rs18,000 crore in 2011-12, from Rs 17,500 crore in the previous year, according to the report Beyond the Top 10 Cities of India. Jaipur, Lucknow are among the top 10 small property markets and the property rates in Lucknow are highest among the top 10 small cities. In Property markets that are still emerging, a robust pipeline of 354 million sq ft of supply is planned for the next three years. Affordable pricing is one of the biggest advantages of housing development in tier II and III cities and towns. The average property price in the 10 small cities taken for the study is pegged at Rs 2,200-2,500 per sq. ft. This is comparable with Pune among the large markets, which has property prices in the range of Rs 3,000-3,500 per sq. ft. Even when prices rose by 25-30% in the large cities in fiscal years 2010 and 2011, the small cities saw increases of only 10-12%, the report said. In 2011, Jaipur had the largest number of home sales. There is a need for improving the regulatory environment and transparency in the real estate sector. The Central government is working on a central legislation to fill the regulatory gaps. In Indian economy growth, the real estate sector is a real growth driver and has absorbed second largest employment in the country after agriculture. The Union government has already given its nod to Land Acquisition draft bill and still there is a need to make land acquisition humane by making the land owners a partner in the urbanization process and compensating them adequately. The new Land Acquisition Draft Bill seeks to balance the need for facilitating land acquisition for various public purposes including infrastructure development, industrialization and urbanization, while at the same time meaningfully addressing the concerns of farmers and those whose livelihoods are dependent on the land being acquired. The draft bill is already get nod from the Union Cabinet and expected to be cleared by the Parliament in the winter session this year. 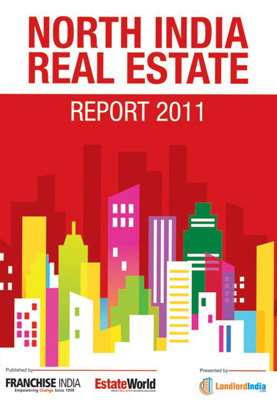 The North India Real Estate Report 2011 covers the end-to-end data and position of real estate sector in North India. India is rapidly urbanizing, not only in form and features but from within. While the metropolises are observing a fast evolving skyline with tall skyscrapers and iconic architecture, the smaller towns and cities are witnessing an unprecedented metamorphosis of the surface through expansion of roads, flyovers and open areas. This change is not irrational exuberance, neither it is an insane explosion of anyone's imagination, it is a necessity. As we enter the new golden wave of real estate that is unfolding before our eyes, its impact on individuals, communities and the nation as well as its global dimension, instantaneousness and prodigies will be fascinating phenomena to investigate. The North India Real Estate Report 2011 highlight on the residential sector, price trends, presents scenario and future prospects.